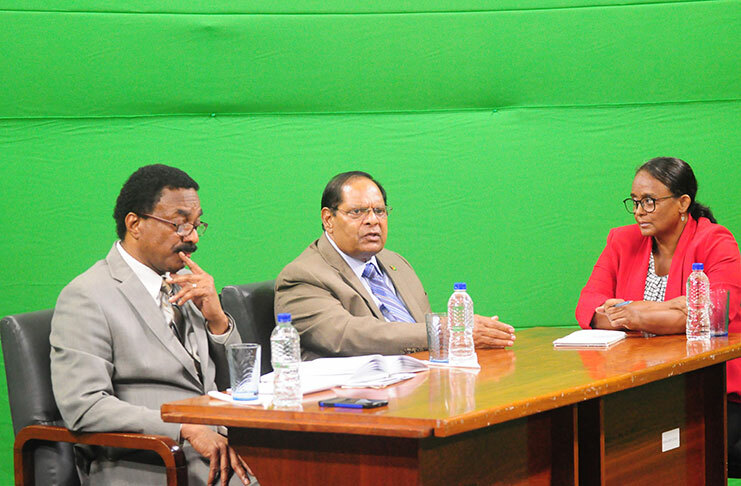 Prime Minister Moses Nagamootoo and Attorney General and Minister of Legal Affairs, Basil Williams, weighing in on President David Granger’s appointment of Justice James Patterson as GECOM chairman during a televised interview with Beverly Alert. ATTORNEY GENERAL and Legal Affairs Minister, Basil Williams,said Opposition Leader Bharrat Jagdeo left President David Granger no other choice than to resort to the proviso provided for in Article 161 (2) of the Constitution, which allows him to appointment a Guyana Elections Commission (GECOM) chairman outside of the lists of nominees submitted. During a live televised interview on the National Communications Network (NCN) with Prime Minister Moses Nagamootoo, the attorney general from the onset stated that President Granger’s appointment of Justice Patterson as the chairman of GECOM was in keeping with the Constitution. “When making such a decision under Article 111, the President is empowered to do so by his own deliberate judgment and under Article 182 it is very clear that the President is not personally liable to the act he performed in execution of his function, in other words, he has immunity and is not liable in civil or criminal proceedings in the office and after he leaves the office,” the legal affairs minister explained. Upon setting the record straight, he said the three lists of nominees submitted by the Opposition Leader were designed to point the President to particular candidates in favour of the Opposition. The attorney general said it was difficult for the President to select a nominee from the first list since it consisted of individuals aligned with the People’s Progressive Party (PPP/Civic). Those nominees included: Governance and Conflict Resolution Specialist, Lawrence Lachmansingh; Attorney-at-Law and Chartered Accountant, Christopher Ram; retired Major General, Norman Mc Lean; Business Executive, Ramesh Dookhoo; Businesswoman and Indian Rights activist, Rhyaan Shah; and History Professor, James Rose. Minister Williams recalled that subsequent to the first list of nominees, the Opposition Leader requested a list of criteria and in response the President stated that the nominees should not be activists in any form and should not have any political affiliation. Despite being furnished with the guidelines, he said, the Opposition Leader continued to insert persons on the subsequent lists that were not fit and proper for the post. Referencing to the case of Marcel Gaskin vs. AG, the attorney general pointed out that acting Chief Justice Roxane George-Wiltshire ruled that the President is not obliged to accept the list or the persons named in it, if he is of the view that the list is deficient, either in totality or in the names that have been included. “Mr. Jagdeo has been putting names on the lists that he knows don’t qualify… and then has one person, and that person he desires, and he hopes that that one person would be selected…. But the President could not have selected a friend of the Leader of the Opposition or a member of his party,” Minister Williams explained. Faced with three lists of a total of 18 nominees that were unacceptable, he said President Granger resorted to the proviso to Article 161 (2). The Article is triggered when a President rejects a list of six nominees submitted by the Opposition Leader for the Chairmanship of GECOM. The attorney general said based on the series of events that unfolded from the time, a request was made for the list of six nominees to be submitted to the last meeting with the Opposition Leader, it is not true to say that the President acted “unilaterally”. “After three lists that were not properly composed by the Opposition Leader, deliberately so, the President as part of the process had to resort to the proviso, otherwise, we would not have had a chairman of GECOM,” the attorney general said. Weighing in on the issue, Prime Minister Nagamootoo said it was critical for the President to appoint a Chairman for the Elections Commission. “While this is not an election year… Local Government Elections are carded for 2018, next year, so you have to start the preparation for that. Then you have to start the process of identifying electoral officers, if you want to go into the elections. Then, General Election is 2020, just two years thereafter. So you needed a functional Commission. You need the Commission to be in place with a head,” the prime minister said. He said the democratic rights of the Guyanese people ought not to be sacrificed for the “whims and fancies” of the Opposition Leader. According to the prime minister, Jagdeo, a former President, inserted nominees on the lists who would have assured him a third term in office. “This whole thing is not about the Elections Commission, it is not about the people of Guyana… this is about the empowerment, the placement of an individual in position of authority,” Prime Minister Nagamootoo posited. He added that Jagdeo is obsessed with returning to office come 2020, when Guyana will be producing oil. The prime minister and attorney general both condemned the vilification of Justice Patterson by the Opposition, in its attempts to gain political leverage.